Stephen Bartholomew Photography | Dear Diary 6th September - “But Someone Has To Do It Tour”. The Final Day at The Land Rover Burghley Horse Trials. Dear Diary 6th September - “But Someone Has To Do It Tour”. The Final Day at The Land Rover Burghley Horse Trials. Dear Diary 6th September - “But Someone Has To Do It Tour”. Burghley to Blair, my daily diary of two weeks of top end equestrian sport from behind the lens. The Final Day at The Land Rover Burghley Horse Trials. Woke early to find clear skies and a sunrise, grabbed the camera and managed a few early shots of Burghley House. Sunday is really non stop with the second inspection, first session of show jumping, lunch, then a quick dash into the arena to set up remote cameras before the final session of showjumping with the top riders, presentations, winners Press Conference and then the traditional photo call with the winner and trophy with the house in the background. Michael Jung with La Biosthetique - SAM FBW won the event with a clear round of showjumping. Michael and Oliver Townend came into the photographers room after the event and signed autographs which was a nice touch to end the day. The next few days will be spent wending my way to Blair Castle for the Europeans with a couple of other photographers to help pass the time. 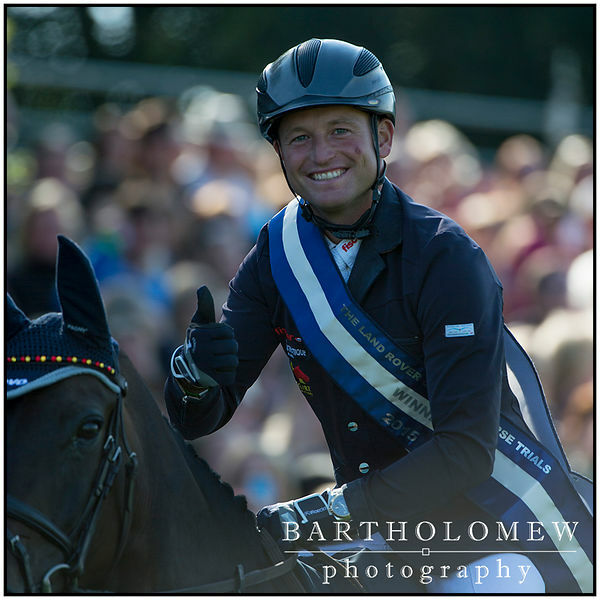 Picture : Michael Jung (GER) thumbs up after his winning clear round.